ALBANY – On August 3, 2011 God reached down from Heaven and took another angel home. Catherine started life in the prairies of Canada; born in the kitchen of a farm house in Govan, Sask. , April 15, 1936, to a prairie teacher and farmer. She attended Victoria College, a division of McGill University with a degree in Physical Therapy. She married Stuart Evan Smith in 1956. She immigrated to the United States in 1957, even though she still felt loyalty to Canada. She lived in Akron, OH; Seattle, WA; Delmar, NY and finally in Albany, NY. She was employed at Albany Memorial Hospital for 27 years as an Occupational Therapist. 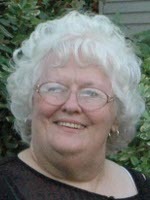 She enjoyed travelling, garage sales, reading and spending time with her children and grandchildren. She is survived by her children Eileen (John) Fogarty, Elizabeth Smith, and Douglas Smith. Her grandchildren, Captain Jason (Courtney) Fogarty, Pooler, Ga, and Joanne Fogarty, East Greenbush, NY (light of her life). Her great-grandchildren Kyle Anderson, Maddox Fogarty, and Aubrey Fogarty (her pride and joy). Also survived by her sister Arlene Berbenchuk and her nieces LeeAnn Berbenchuk and Lisa Bridger of Regina, Sask. There will be a private memorial service for family and friends. To leave a message of condolence for the family, please visit www.HansFuneralHome.com . Our thoughts and prayers are with you all. We know that you will miss her terribly but, we also know that she is smiling down on you from above now. It’s many years since we lived in the same city, but it was always great to talk on the phone, and in the good old days to write letters. See you all soon. Just keep thinking of all the good times. Clint, Bailey and I want to express our sincere condolences for the loss of your mother, grandmother, great grandmother and my aunt. Our thoughts and prayers are with you all during this most difficult time.